Forming the team of Cobell/Stephenson was the natural extension of many years of collaborating on multiple projects representing both buyers and sellers. These two highly productive individuals entered the real estate industry in 2009 having come from seemingly different backgrounds yet sharing so much professional history. Wendy brings 30 years of experience in sales, management and strategy with IBM while David had been the Vice President of Sales for a major couture fashion house developing sales strategies and marketing globally. Together their experience and perspective offer an outstanding combination of professionalism, integrity and proven results. As a resident of New York City for over 40 years and Brooklyn for 28, David has first hand experience of how dynamic and ever changing the neighborhoods are across the city. As a member of Prospect Park Alliance, The Brooklyn Museum of Art and a supporter of MSKCC, ASPCA and St. Jude’s Children’s Hospital David continues his commitment to all things New York. 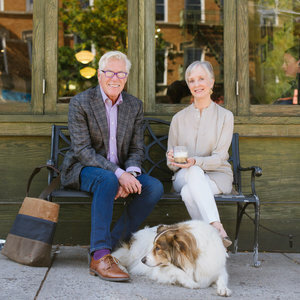 Wendy and her husband have lived in Prospect Heights since 2001 and as supporters of the Brooklyn Academy of Music, The Brooklyn Museum of Art, The Brooklyn Botanic Garden and Prospect Park Alliance are passionate about Brooklyn. As a proclaimed “foodie” Wendy keeps her finger on the ever changing restaurant scene in NYC and globally.